Karen has written a book about me, and wanted very much to deliver a copy to Alresford Library in order for people in the town to read about my life. 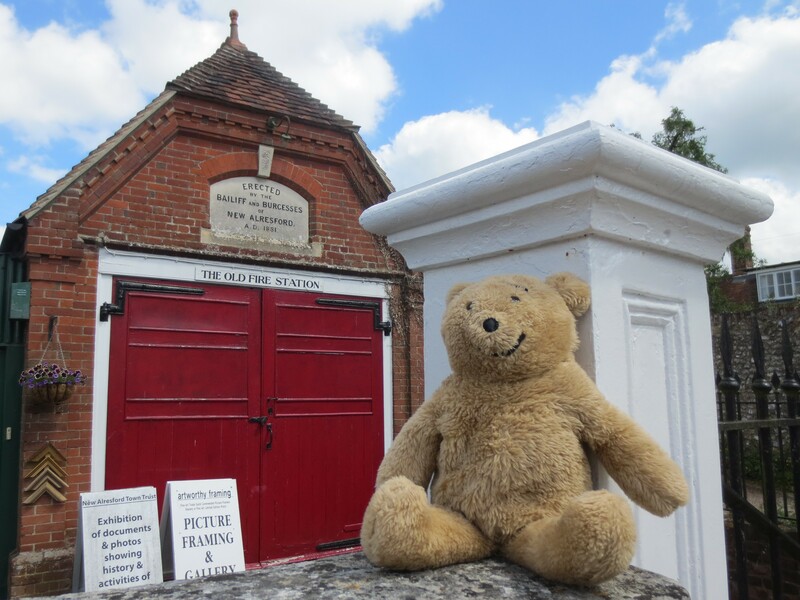 So, a couple of weeks ago on the way to France ( yes this sounds odd, but we were on the way to Portsmouth to get on a ferry) we spent a while in Alresford. 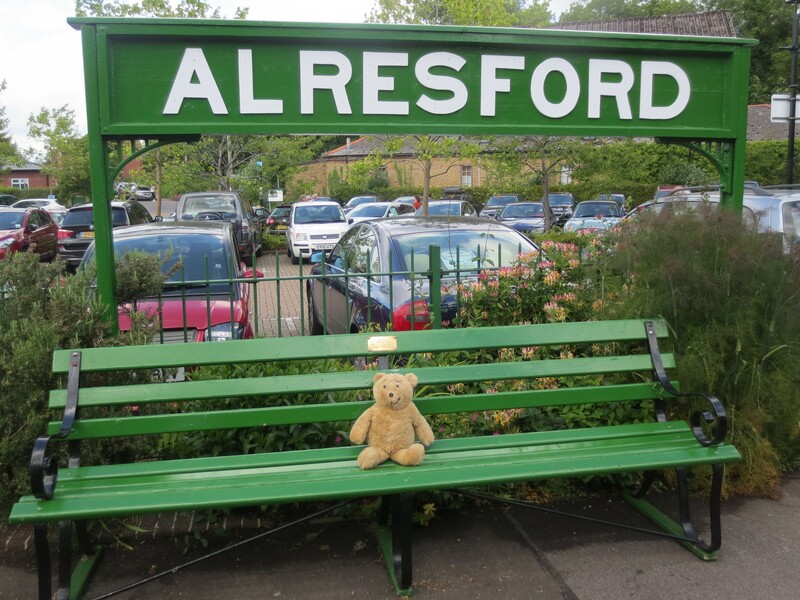 I don’t remember much about the town where I was made, I guess after being stuffed I was put in a box and sent off to a shop to be sold, so wouldn’t have seen much Alresford. Anyway, I was delighted to find that it is a lovely place and I am proud to carry the name of this place on my label. 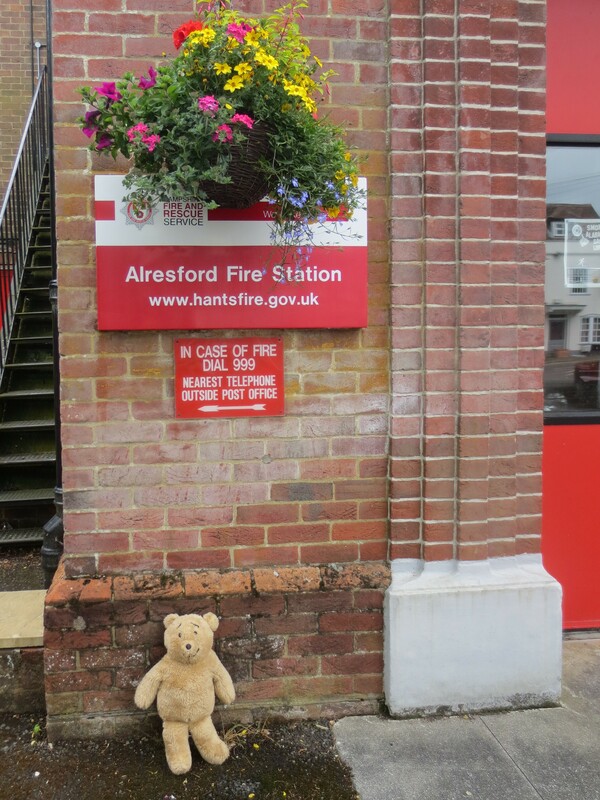 The first place we visited after parking the car was Alresford Library. 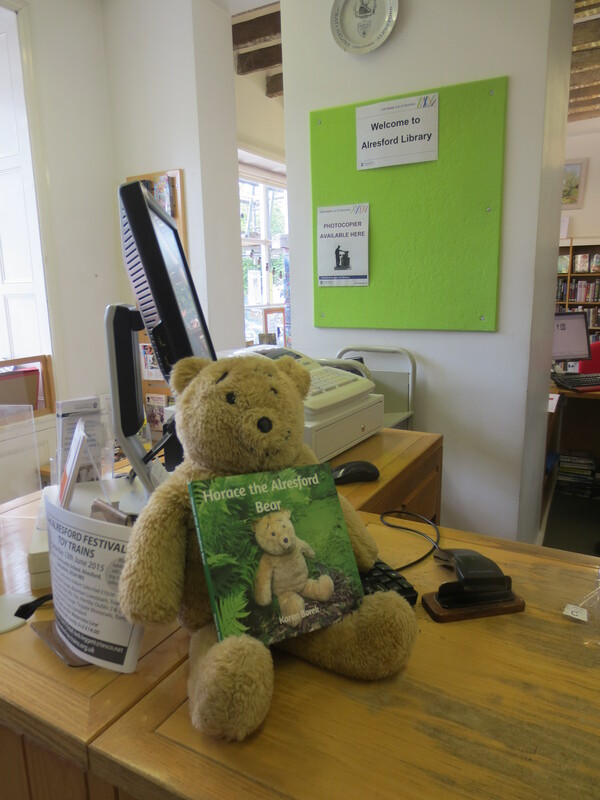 The staff there seemed a bit surprised to have a visit from a bear but they seemed to like the book. It is only a very small library, nothing at all like the library I usually visit, Bristol Central Library. 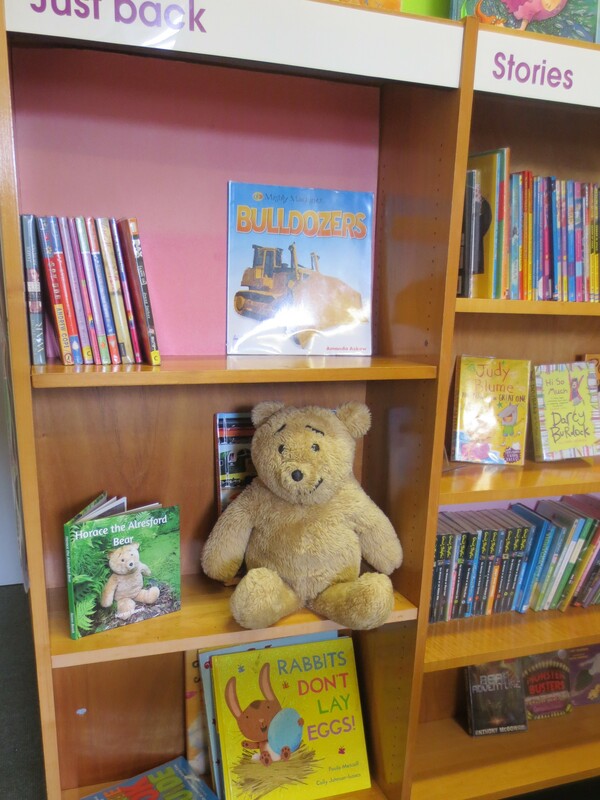 The children’s section is upstairs, and just the right size for bears and children. After visiting the library Karen decided we all needed a nice cup of tea. 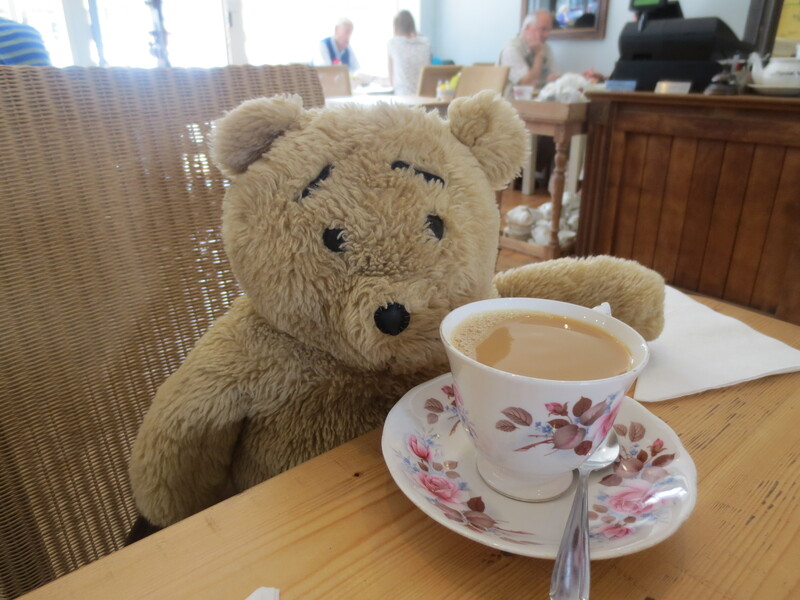 We found a traditional tea room called Tiffin, and I must admit the tea was brewed as tea should be, and I do like china cups, those mugs some places use are so heavy for a small bear like me to lift up. Now it was time to find out where I was made, and whether the building was even still there. After examining maps and signposts, off we went to find the place where The Town Mill might have been, and to our delight, we found it. 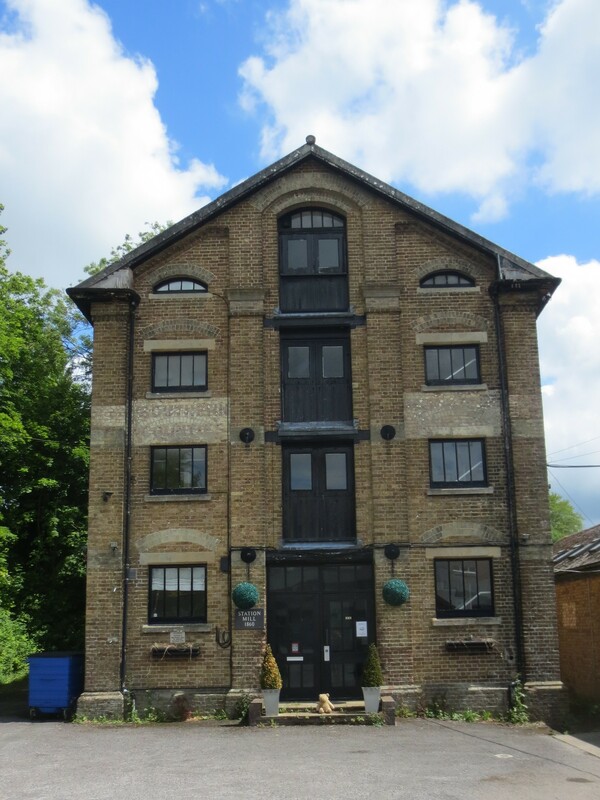 Now converted into flats, but a lovely place with a waterfall right next to it. I felt quite emotional and had to sit quietly on the grass for a few moments. Then Karen helped me up onto a post for a photo of me right in front of the building in which I was made. 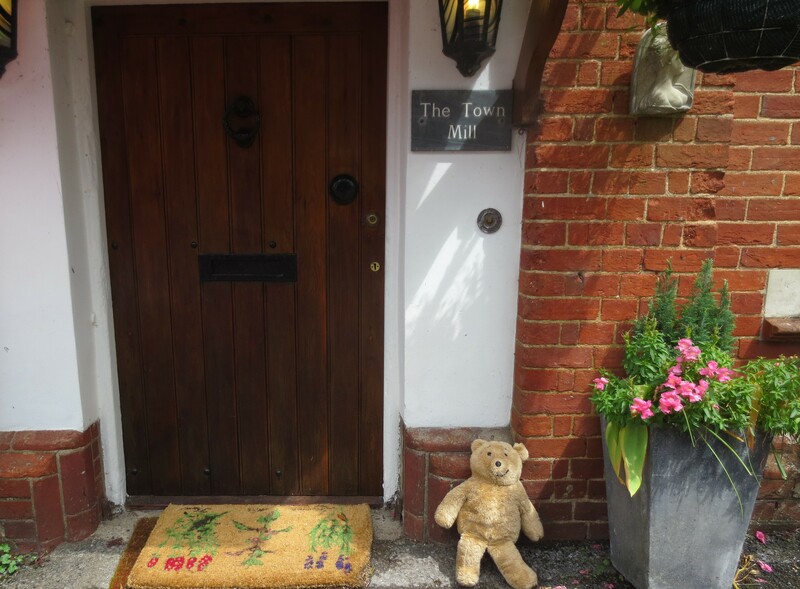 Here I am by the front door to the apartments which has the name plaque ‘The Town Mill’ and confirmed we had the right place. 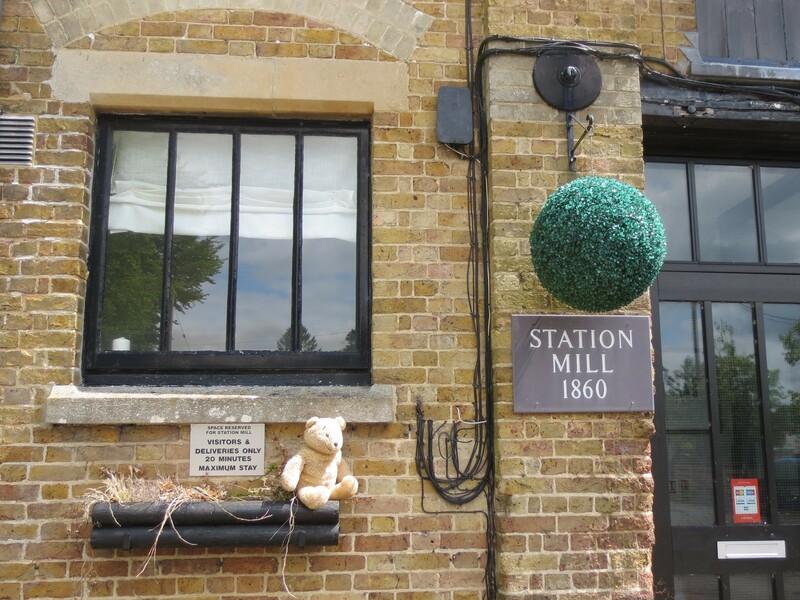 Karen thought it would be nice to find the place where some of my relatives were made too, as newer bears were made in The Station Mill, so we set off to find it. Not surprisingly it was next to the railway station. I think someone needs to do some gardening there though as there were no flowers in the window boxes. 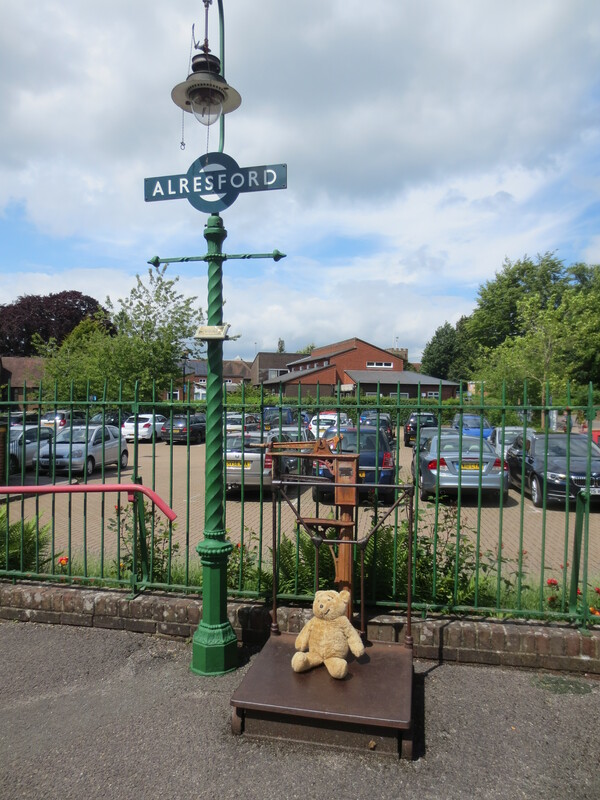 We went on the visit Alresford Station, which was really exciting as old steam powered trains run from there. There were some interesting scales for weighing luggage, and bears …and a seat for people and bears waiting for trains. 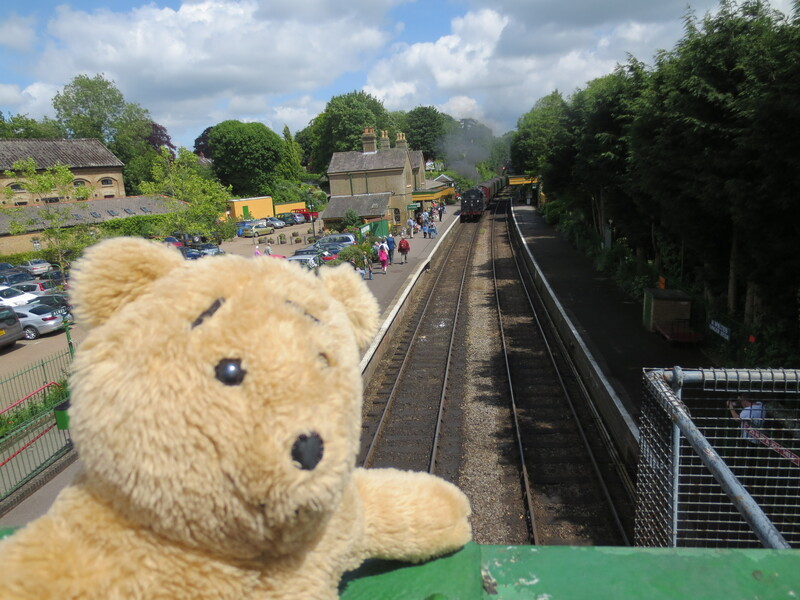 Then the most exciting thing happened, a steam train came puffing into the station just as I had climbed up onto the bridge that crosses the track. 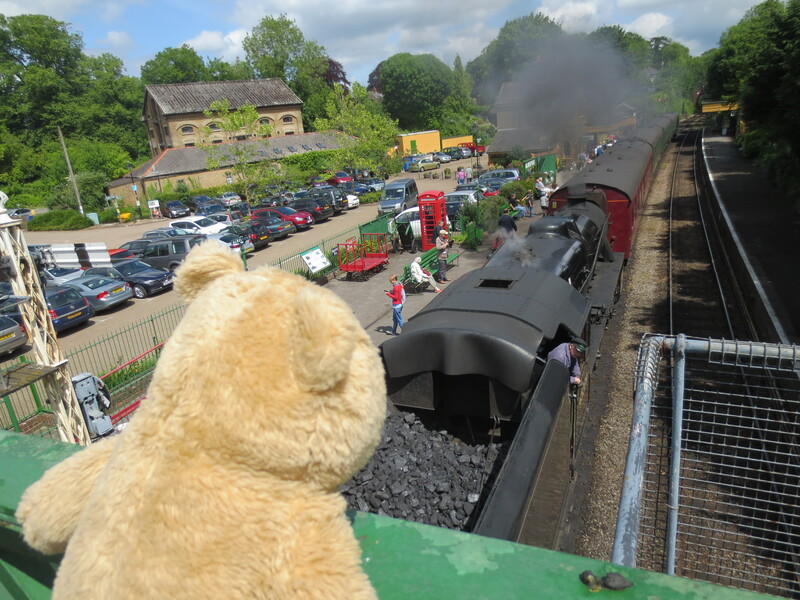 I thought it was a shame that we didn’t have Growler present as he is very fond of steam engines – I will have to ask Karen to bring him along too next time. I then did a bit of modelling next to the station sign and the train. The train used to be used to transport watercress, which is grown in the area for people to eat. 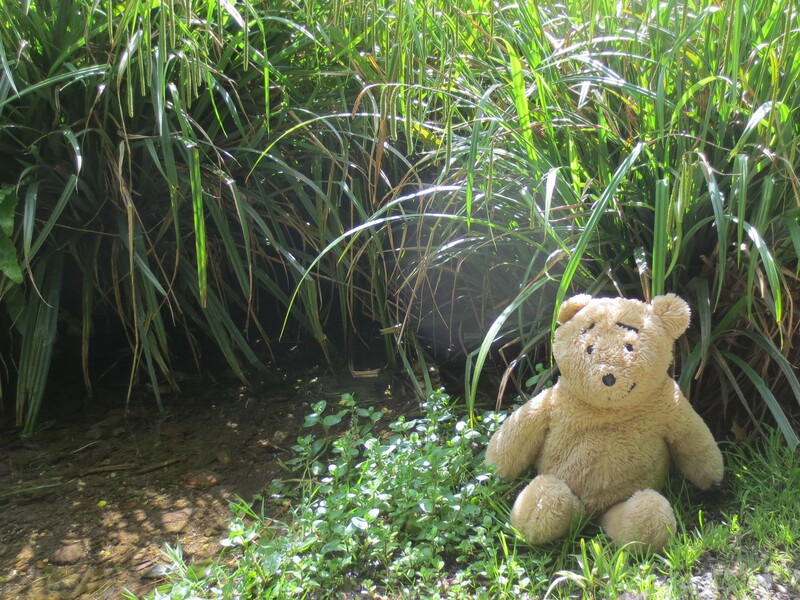 I found some in the nearby stream but I prefer cake. On our way back to the car we also came across The Old Fire Station, now a picture framing gallery, …and here I am at The New Fire Station:- I didn’t see any Firemen though, which is a shame as I would have liked to try on their hats. 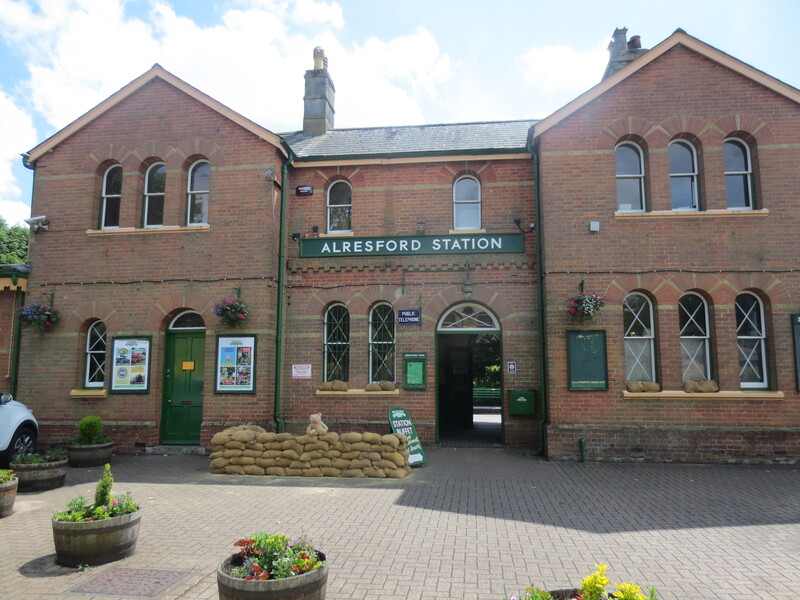 I thoroughly enjoyed my visit and I am happy to know that me and all my Alresford relatives were made in such a beautiful place. I hope to visit again one day. 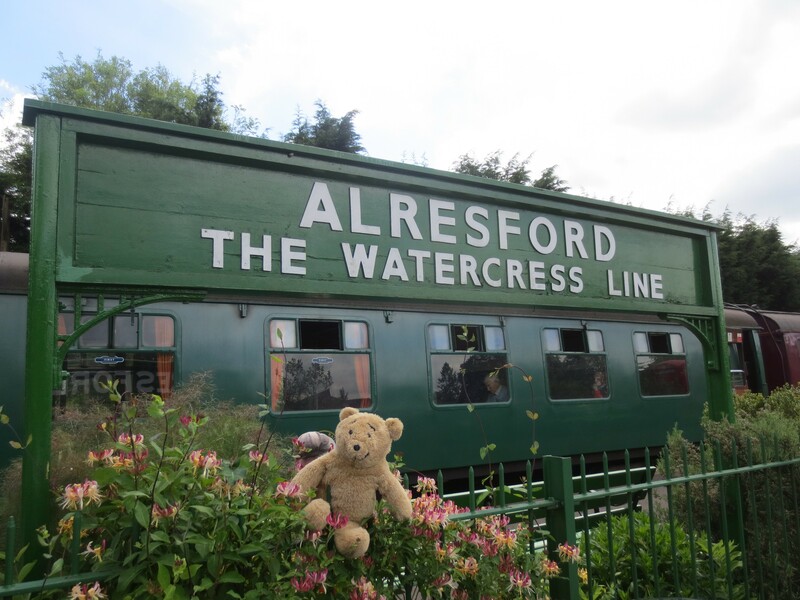 This entry was posted in Uncategorized and tagged alresford bear, alresford library, hampshire libraries, Tiffin, watercress line by karenlovestodance. Bookmark the permalink. 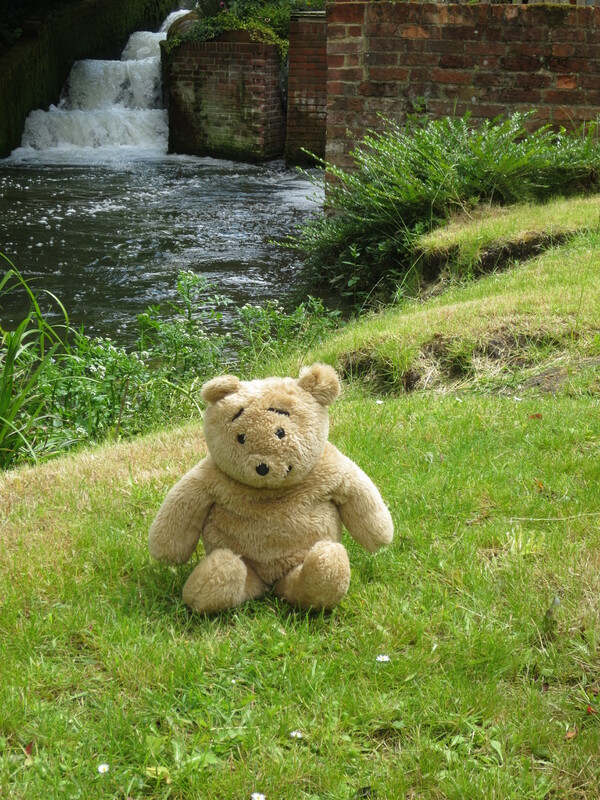 We look forward to seeing Horace in Alresford when you are on your way home. Don’t forget to visit all the other Alresford Crafts soft toys, including Ollie the Owl, in his display cabinet upstairs in the library! We noticed all the soft toys in the cabinet when I visited – we tried to take a photo but the glass just reflected back so it didn’t come out. A smaller owl just like Ollie lives in the same house as Horace. We are back home in Bristol now – we couldn’t visit again on the way home as the homeward bound ferry docked at 9.30pm in the evening at Portsmouth.